On my Instagram stories a month ago I took you through my 16 hour kitchen reorganization marathon. Why in the heck would I do that you ask? I got a lot of questions in my PMs. I'll take you through my educated and experienced reasoning behind how I organized my home kitchen. I rent my abode otherwise I would have designed things differently had I built it. For instance drawers > cabinets, cabinets above the dishwasher so plates and glasses can be put away more efficiently, etc. And no, more counter space is not the answer unless you're planning on butchering a whole animal or you like to do commercial baking from home. More counter space makes it easy to spread out your items. Consider these organization solutions instead! I had been living at my place for a couple of years and found my kitchen was annoying to cook in. I like experimenting with food (obvi) and I found that my pots and pans needed 7 hours (not really) to dig through since they were stacked and haphazardly thrown among pantry items, my spices were in one layer in a cabinet so it took forever to find what I needed and glassware and drinks for entertaining people was not easily accessible. Finished tea and coffee shelf, booze at the bottom. I may buy a cart for this instead one day. I unearthed all the drawers and cabinets that weren't well organized onto my counters, dining table and eventually my floor. I put aside items that I didn't need anymore (spices that I didn't like, bakeware I would never use, etc). This went to a home that would use it. I looked at grouped items and looked at a) where it made the most sense to have them (ex. 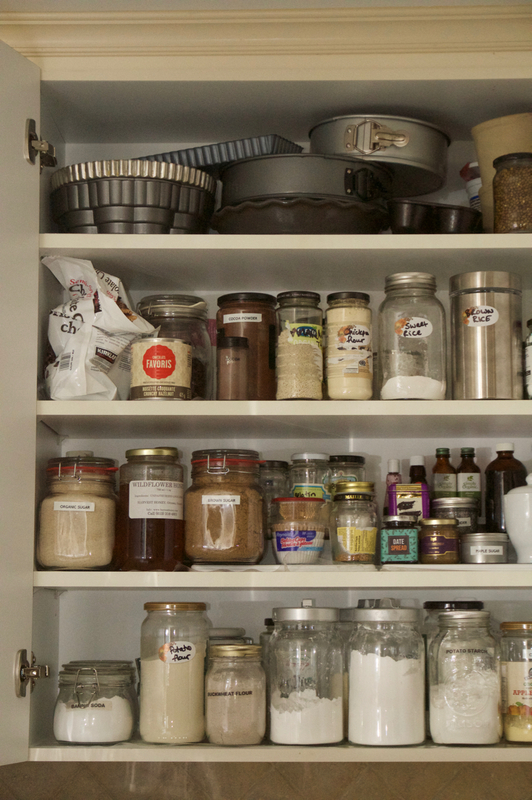 spices near the stove along with frequently used condiments near stove like oils, salt and pepper, pots near by, bakeware that's infrequently used on a top shelf) and b) where there was enough space for all the items. Then I had to decide what storage 'solutions' I needed to buy to make the group of 'themed' items fit into the spaces I preferred those items in. Misc bags of bulk items like spices, weird flours, rice, went into clear jars I had collected over the year. Then I used a label maker to label them. This helps a LOT with seeing levels of what you have and finding them in a glance. Since I do a lot of gluten free baking and experimenting, I have a lot of little items like flavorings and additives. It was helpful to get a 3-tiered non slip shelf organizer like this one. I bought a few more for my epic spice cabinet, too. I have a lot of different cutting boards so I found an organizer like this at a thrift store. This was also helpful for organizing my sheet pans so I bought a similar one! There are also customization ones. I bought a couple to organize my skillets and wok. I don't believe you should have pot lids in one place and pots in another. Believe it or not you save space (and sanity) storing pots with their respective lids actually on the pot. To help make space for my monster sized pot, I bought this cabinet divider. I will probably get a couple more to organize my cabinet with misc appliances that I don't use often. I bought this slide on shelf for my tin foil, parchment, etc a while ago but I thought I'd suggest it. I have frequently used condiments for cooking on a large plate I can just move up onto my counter when I need it! It took me a while, yes but the pay off and time saving in the long run was worth it! I love being able to grab what I need right away. And make sure you keep your needs in mind. 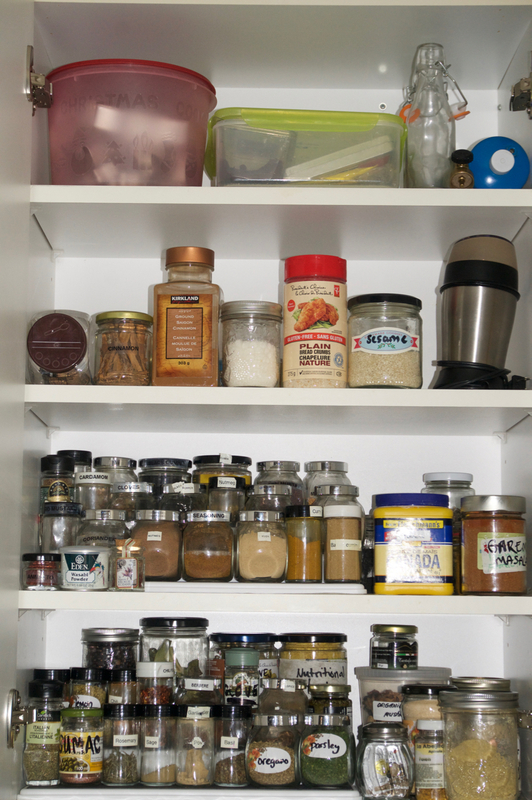 You might not have 3 shelves worth of spices for example. Maybe put your oils and what not with them if there's space. Either way, I believe in you! Comment below with your kitchen struggle and I'll offer a suggestion. Happy cooking.